Organic Food: produced without GMOs; helps preserve natural resources & biodiversity; produced at certified farms & facilities. USDA Organic. Certified Organic by CCOF. www.ccof.org. Reclosable seal. Recipe ready. Steams in pouch. Since farm 1984. Freshness Guaranteed: If you're not happy with this product - for any reason - connect with us at 800-490-3200 or earthboundfarm.com and we'll make it right. Facebook; Twitter; Instagram; Pinterest. how2recycle.info. Processed in USA. Product of USA. 100% vegetables. Gluten free. No sauce or seasoning. 4 g carbs per serving. 85% fewer calories than rice (85% fewer calories than the leading brand of prepared white rice) (Green Giant Riced Cauliflower and Broccoli contains 20 calories per 1 cup serving. Leading brand of prepared white rice contains 170 calories per 1 cup serving). 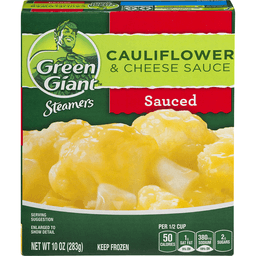 Behold the power of cauliflower Green Giant Riced Veggies are exciting cauliflower-based blends that are a gluten-free, low-calorie. Enjoy as a great alternative to rice, potatoes, and pasta. These veggies are ready for roasting, baking, sauteing, mashing or steaming. Questions or comments? 1-800-754-3381. For more recipes, visit us at greengiant.com. Facebook. YouTube. Instagram. Product of USA. 100% vegetables. Gluten free. No sauce or seasoning. New. 11 g carbs per serving. 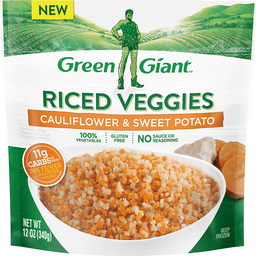 70% fewer calories than rice (70% fewer calories than the leading brand of prepared white rice)(Green Giant Riced Cauliflower and Sweet Potato contains 50 calories per 1 cup serving. Leading brand of prepared white rice contains 170 calories per 1 cup serving). Questions or comments? 1-800-754-3381. 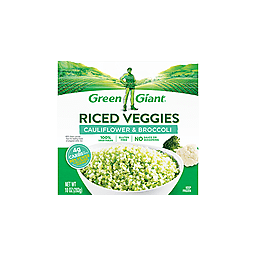 Behold the Power of Cauliflower: Green Giant Riced Veggies are exciting new cauliflower-based blends that are a gluten-free, low-calorie food. Enjoy as a great alternative to rice, potatoes, and pasta. These veggies are ready for roasting, baking, sauteing, mashing or steaming. 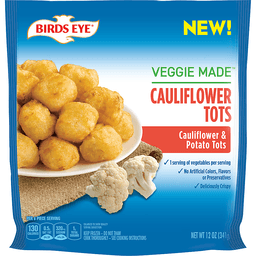 Per 1/2 Cup: 50 calories; 1 g sat fat (5% DV); 380 mg sodium (16% DV); 2 g sugars. Questions or comments? 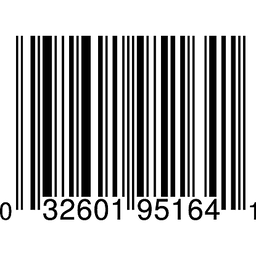 1-800-754-3381 Mon-Fri 7:30 am-5:30 pm CT. See how we lock in freshness at: www.GreenGiant.com. how2recycle.info. The abundant variety of Green Giant sauced vegetable blends will make sure you and your family enjoy the vegetables you need to live a balanced lifestyle. 100% recycled paperboard. Carbohydrate Choices: 1/2.